For the fourth year in a row, the City of Knoxville granted a total of $500,000 to owners of historic residential or commercial buildings through its Historic Preservation Fund Program. Proposals were accepted through 11 a.m. on December 4, 2018. You can read the Request for Proposals, Addendums and Proposals Submitted. Mayor Madeline Rogero created the Historic Preservation Fund with an initial commitment of $500,000 in the 2014-15 budget, and an additional $500,000 has been funded by City Council each year since. The fund is intended to help fill financing gaps for renovation of historic properties within city limits. Applicants must own the property, which may be residential or commercial and located within the city limits. Funding will be secured by a deed of trust on the property. The project will restore the porch of the neighborhood community center known as The Birdhouse to its original status as a wraparound-style porch. The Birdhouse hosts a variety of community, educational and cultural events. Owners of this one-time Ford dealership propose to restore the building to its original splendor in preparation to house the headquarters of local third-party logistics company Axle Logistics. There’s also the potential for retail on the ground floor. This project will stabilize exterior masonry on the 110-year-old theater, which is part of the 200-year-old Lamar House. In late 2018, the City helped Knox Heritage move this circa-1900 Queen Anne home from its original address at 1804 Highland Avenue (purchased by Fort Sanders Regional Medical Center to use as a parking lot) across the street to 1815 Highland Avenue. Knox Heritage will restore and renovate the house into rental apartments that will serve as a source of income for the non-profit preservation organization. Built in 1939, the Art Moderne-style Taggart Building originally housed both residential and commercial tenants, including the Arlington Branch of the Knox County Public Library. Current owners plan to renovate the building into 11 market-rate condominiums that share a courtyard. Rather than a grant, funding for this project will be a repayable loan, meaning that as individual owners buy the condos, the developer will repay that portion of the loan back to the City, which will return those funds to the Historic Preservation budget. This fund was created in response to feedback from residents concerned that home repairs were cost prohibitive to some homeowners in neighborhoods with historic overlay protection zoning. With support from the City, Knox Heritage will create a program to administer these funds to homeowners in H-1 districts whose income levels prevent them from making home repairs that meet overlay guidelines. 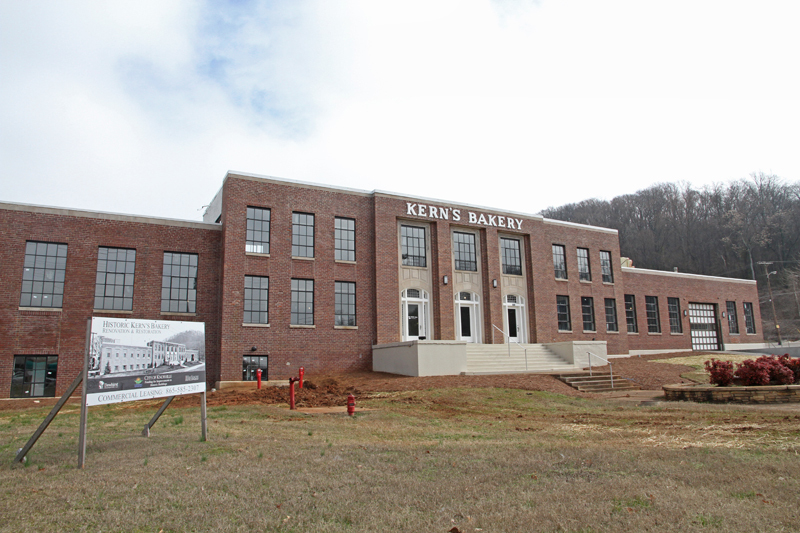 This grant funds Knox Heritage’s efforts to complete the application process to add the Standard Knitting Mill (1400 Washington Avenue) to the National Register of Historic Places. Being listed on this register opens up properties to opportunities like tax credits and federal grants. • The Dempster Building, $200,000, located at 611 - 617 North Central St. This project will include restoration and development of two, long-vacant buildings into a mixed-use development to include residential units and commercial tenants. Built in 1895 as the W.C. McCoy Livery, it was one of the first buildings in what was known as the Central Market area. In the 1920s, it housed Dempster Construction Company and Dempster Motor Company, owned by George Dempster, who served as Knoxville Mayor 1952-1955 and invented the Dempster Dumpster. • Baker Creek Bottoms (former Sevier Heights Baptist Church), $150,000, located at 3700 Lancaster Dr. The church’s large sanctuary will be developed as an event and performing arts venue. The smaller, original sanctuary is being restored to house a restaurant utilizing funding from last round. • Former Tex Ten Printing Supplies, $100,000, located at 1520 Washington Ave. Originally a grocery store, the building will be restored and developed as a new home for three businesses in the Park City neighborhood’s historic commercial district. Funding will be used for structural repairs to both walls shared with neighboring buildings. • Mabry-Hazen House and Meek Cottage, $27,770.60, located at 1711 Dandridge Ave.
Funding will be used for additional renovation and restoration of windows, siding, and porch repair for the historic home. • Blount Mansion, $21,383, located at 200 W. Hill Ave. The Blount Mansion Association will use the funding to restore the windows of the home, which was constructed between 1792 and approximately 1820. • Baker Creek Bottoms Chapel, $150,000, former Sevier Heights Baptist Church, at Lancaster Dr.
• Former Rayl School property, $150,000, site of now-closed Free Service Tire, at 300 Magnolia Ave.
• Cal Johnson Building, $100,000, located at 301 State St.
• Keeton’s Jewelers Building, $40,031, located at Martin Luther King Jr. Blvd. • Downtown YMCA, $36,521, located at 605 Clinch Ave.
• Bijou Theatre, $33,903, located at 803 S. Gay St.
• Mabry-Hazen House, $16,393, for guest house front porch, window restoration and caretaker cottage back porch at 1711 Dandridge Ave.
• Magnolia Avenue United Methodist Church Parsonage, $8,649, located at 2700 E. Magnolia Ave.
• Craighead-Jackson House, located at 1000 State St.
• First Christian Church, located at 211 W. Fifth Ave.
• Historic Riverhouse, located at 614 W. Hill Ave.
• Lloyd Branson House Phase II, for new windows and dormers above the front porch styled to match the home's original design at 1423 Branson Ave.
• Mabry-Hazen House, for restoration at 1711 Dandridge Ave.
• Tennessee Theatre, for new marquee outfitted with LED lights at 604 S. Gay St.
• Lloyd Branson House Phase I, located at 1423 Branson Ave.
• McMillan Flats, located at 507 N. Central St.
• Metropolitan Planning Commission, to help inventory mid-century neighborhoods and buildings as prospective candidates for the National Register of Historic Places. • Park City Presbyterian Church, for new roof and gutters on the main building at 2204 Linden Ave.